It was discovered in 1542 by Juan Rodriguez Cabrillo, a portugues navigator and named “San Mateo”, afterwards it was named “Ensenada de Todos los Santos” by Sebastian Vizcaino who arrived in 1602 on November 2nd, the day on which Mexico celebrates the day of all the saints or day of the dead. But it wasn’t until 1870 when gold mines were discovered in Real del Castillo, that Ensenada was put on the map and its development grew on a faster pace. It became a shipping center and the capital of the northern Baja California Territory in 1882. Just around the century, the mines were exploited to there capacity, the government office was moved to Mexicali and the town returned to the peaceful atmosphere felt in the first days. In the 1920’s the prohibition of the United States offered prosperity to the border towns of Baja California. In that time was when the construction of the Hotel Playa and Casino (Riviera del Pacifico Cultural Center) took place becoming a great attraction to the Southern California wealthy people and Hollywood stars. But gambling was outlawed by the Mexican Government and had to stop its function. Nowadays this building is a historical landmark in Ensenada as well used for civic, social and cultural events. "Please do not forget to visit the Ensenada Hotels guide for reservations and complete Ensenada Hotels". Also for a complete dinning experience try the Ensenada Restaurants guide, featuring the top Ensenada Restaurants. 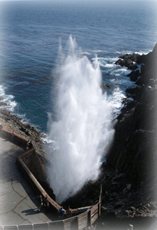 As well in the surroundings the mayor attraction is a natural geyser named “La Bufadora” and is better known as the blowhole, where you’ll find complimentary breathtaking views. Unique in the whole world. Ensenada’s great climate offers an array of opportunities to practice outdoors activities as horseback riding, swimming, snorkeling, windsurfing, surfing, fishing, sailing and diving. On the other hand, sports are easy to practice, as golf in the professional golf course in Bajamar in the north or in Baja Country Club in the south, volleyball on the beach, tennis, jet skiing, etc. Services are varied in accommodations from luxurious hotels to campgrounds and RV parks well equipped, restaurants specialized in International cuisine, supermarkets, hundreds of shops, pharmacies, bakeries, gas stations, medical facilities, banks, and an airport where private planes and charters may land with a permission from the Second Military Zone. Also Ensenada has become the second most important port of call for mayor Cruise lines, that arrive on Wednesday, Thursday and Saturdays on weekly basis. The cuisine is exquisite considering some options as El Rey Sol, Mariscos Bahia de Ensenada, Casamar, and hacienda de El Charro. Ensenada is renowned for the Seafood Fair held since 1978. Some other culinary events talk place as the Chili cook off, the wine harvest festival, the Paella Contest and the “El Hongo” fair, both last two new on the list. Mayor sports events take place as the Newport-Ensenada regatta, the off road races Baja 500 and Baja 1000, the fun bicycle ride from Rosarito to Ensenada and the Carnaval (Mexican mardi grass). For more information contact the Convention & Visitors Bureau at Blvd. Costero. (tel. 01-6-1782411 or 0-6-178-3675). DESIGNED BY SAN DIEGO RESTAURANTS and San Diego Online. © Copyrights 2009, by San Diego Online.